Ankle surgery recovery takes time, typically 6-12 weeks depending on the type of surgery and the severity of the injury. Although you can’t avoid a certain amount of time for ankle surgery recovery, there are steps you can take to help accelerate the healing process. This is one of the hardest things to do for some people, especially athletes, but getting a lot of rest in the first several days after ankle surgery can go a long way toward speeding up the healing process. Your body does a lot of healing while you sleep, and if you stay in bed with your ankle elevated you will reduce the amount of strain you put on the tissues that are repairing themselves. Your body needs energy to heal, and a lot of it. Energy comes in the form of calories, so it’s important to maintain a healthy diet. In addition to energy, you also need a good balance of nutrients, so stock up on fruits, veggies, and lean proteins. Hydration is also an important factor in accelerating injury recovery, so be sure to drink plenty of water. 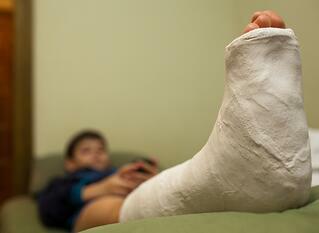 Cold therapy is a critical step during ankle surgery recovery because it helps reduce pain and swelling. You can use ice packs, but many doctors now recommend the use of a cold therapy machine because it is more effective. Cold therapy machines come with an ankle wrap that conforms to your body and circulates cold water at a consistent temperature. Because the wrap comes into contact with more surface area, the therapeutic cold can penetrate deeper to reach the healing tissues and reduce inflammation. This leads to faster healing and also has the benefit of reducing pain without the use of medication. Another benefit to using a cold therapy machine is that it also provides active compression at the same time that it delivers consistent cold. Compression is important for speeding up ankle surgery recovery because it helps reduce swelling and pumps freshly oxygenated blood to the healing tissues. Remember all those nutrients you are getting from your healthy diet? They are also tagging along in the bloodstream, so they reach the surgery site more quickly as well. Simultaneous compression also increases the benefits of cold therapy, so you get even more out of each treatment session. Ankle surgery recovery will take some time, but the more proactive you are about getting enough rest, eating right, and using cold and compression to control pain and swelling, the faster you will get back on your feet. If you’re interested in learning more about a cold therapy machine for your ankle surgery recovery, talk to your doctor or get in touch with Game Ready today.